Is Litecoin the 'lighter' sibling of Bitcoin? Bitcoin is no doubt a more well-known cryptocurrency, but you might be surprised to learn that Litecoin was introduced more than five years ago. Time to have a closer look at what Litecoin stands for and how it compares to Bitcoin! This article promises to explain such key questions as: How does Litecoin work? How does Litecoin creation work? Is Litecoin risky? We'll start with the most basic question: What is Litecoin? Litecoin is a peer-to-peer cryptocurrency. It is an open-source software project released under the MIT/X11 licence, which means that it places only very limited restrictions on its re-use. To verify the transfer of funds and secure transactions. Although Litecoin and Bitcoin are similar in many ways, there are a couple of major differences between the two cryptocurrencies. 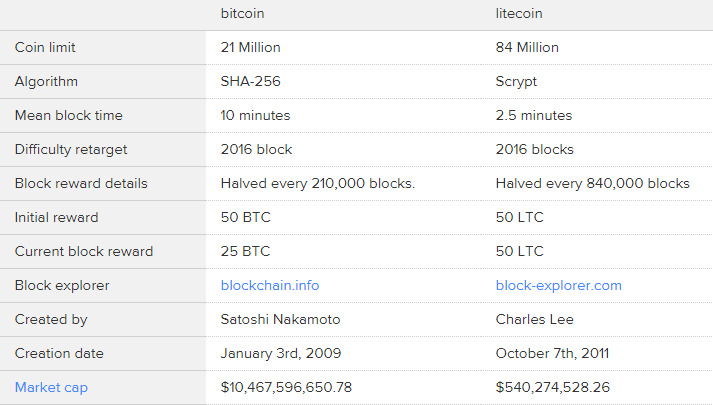 What's the Difference Between Litecoin and Bitcoin? Some traders say that if Bitcoin is the equivalent of gold, Litecoin could be compared with silver. In fact, this is exactly what Litecoin developers had in mind when creating it. Litecoin offers faster confirmation: The Litecoin Network aims at processing a block every 2.5 minutes, rather than Bitcoin's 10 minutes, which its developers claim allows for faster transaction confirmation. A distinct drawback is a higher probability of orphaned blocks. Litecoin uses a different hashtag algorithm: Litecoin uses scrypt in its proof-of-work algorithm, a sequential memory-hard function requiring asymptotically more memory than an algorithm which is not memory-hard. All in all, Litecoin can process and handle a larger amount of transactions which reduces potential bottlenecks, as sometimes seen with Bitcoin. Please check out the image below for a quick overview of both cryptocurrencies. Advantages can include greater resistance to a double spending attack over the same period as Bitcoin. What's the Abbreviation for Litecoin? The abbreviation for Litecoin is simply LTC. The same principle as with USD (US Dollar) and EUR (Euro) applies. Litecoin can also be paired to other currencies. In that case, the currency pair name could be, for example, Litecoin vs US Dollar, or LTC/USD. The payment system does not handle physical currencies, like the Dollar or the Euro; instead, it uses its own unit of account, which is also called Litecoin (symbol: Ł or LTC). This is why you will often see Litecoin categorised as a virtual or digital currency. Litecoins can be bought and sold for traditional money at a variety of exchanges available online. Litecoin has a higher frequency of block generation, which means that the network supports more transactions and benefits from quicker confirmation times. New Litecoins are created regularly. The creation of new coins is completed via a special process called mining, which is simply a record-keeping service. The way Litecoin makes sure there is only one blockchain is by making blocks really hard to produce. Instead of just producing blocks at will, miners have to make a cryptographic hash of the block that meets certain criteria, and the only way to find one is to compute many of them until you get lucky and find the one that works. This process is called hashing. The miner that successfully creates a block is rewarded with 25 freshly minted Litecoins. Every few days, the difficulty of the criteria for the hash is adjusted based on how frequently blocks appear, so more competition between miners equals more work to find a block. Where Does Litecoin Come from? The growth of the Litecoin supply is de-centralised and guided by the Litecoin protocol, which assigns the creation of new coins to Litecoin participants. The maximum number of Litecoins is limited to 84 million in total, but not all coins have been created yet. At the moment, there are approximately 51.7 million coins in circulation, which is about 61.6 of the total. Once there are 11.3 million new coins created, the block mining reward will decrease from 25 to 12.5 coins, which is expected to occur some time in August 2019. It is thought that Litecoin was released via an open-source client on GitHub on 7 October, 2011 by Charlie Lee, a former Google employee. It was a fork of the Bitcoin Core client, differing primarily by having a decreased block generation time (2.5 minutes), an increased maximum number of coins, a different hashing algorithm, and a slightly modified GUI. 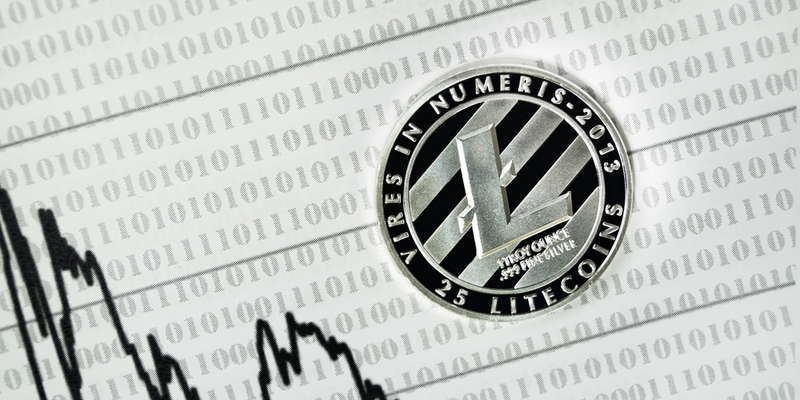 Although it was built in October 2011, the financial history of Litecoin originates in November 2013. The Litecoin development team released the 0.8.5.1 version first, and the aggregate value of Litecoin experienced massive growth, which included a 100% leap within 24 hours. Early December 2013 saw a new version of Litecoin. This new improved version offered a 20x reduction in transaction fees, along with other security and performance improvements in the client and network. Should You Try to Mine Litecoins? Exponential network difficulty: Difficulty will increase as more and faster miners join the network, driving your profitability down. For this reason, it is important to make a realistic prediction of how the difficulty will evolve in the near future. Potential low resale value: ASIC hardware can mine Litecoins extremely efficiently, but that's all it can do. It cannot be refitted for other purposes, so the resale value is very low. Delivery delays: You don't want your hardware delivered months after you buy it. In particular, there have been many bad reviews on the Internet about pre-ordering mining hardware. Power consumption: You don't want to pay more in electricity than you earn in Litecoins, right? Simply said, trading Litecoin vs USD should be far more interesting, profitable, and less expensive. Litecoin can be used and spent for a long list of goods with different types of merchants. The first step is to download a Litecoin wallet to be able to buy Litecoins from an exchange, which you can then use to purchase goods and services with Litecoins. Litecoin operates independently of any central bank, contrary to other well-known currencies, e.g., the US Dollar and the Euro. The Litecoin network does not have any other central point or single administrator either, which makes it a decentralised digital currency. What are the Risks of Trading Litecoin? As with Bitcoin, there is little historical valuation range and comparative cryptocurrencies. Basically, the question of how you assess what is fair value is difficult to answer. Changes to International Capital Controls could reduce cryptocurrency demand. Countries like China have laws that protect capital outflows; hence, money is being flooded into unregulated cryptocurrencies to avert such capital controls. A change in laws regarding capital outflows could dampen demand. It is unregulated, thus, some may consider it a high risk. However, this is subjective; at the end of the day, it's just a currency. It is a currency, similar to a commodity in nature; hence, it is subject to market fluctuations, such as demand and supply. But this should be a positive risk for traders dealing with commodities. The short answer is: yes. Regulations vary country-by-country, but you can expect to see national financial regulators interested in Litecoin and other virtual currencies, potentially along with regional regulators at a sub-country level. Is Litecoin Safe to Trade? Yes, it is just as safe to trade as Bitcoin, or any other commodity, for that matter. In fact, the popularity of Litecoin has skyrocketed. The volume of transactions has substantially increased over the past few months. Before April 2017, the average volume of transactions was mostly between 1 and 10 million USD to 200 million USD in May, and even above 400 million USD in June 2017. Stay tuned for more exciting information and analysis on Litecoin… But why wait? You know it's now possible to trade Litecoin on an Admiral Markets Demo account. Give it a go today… Practise makes perfect!